This weekend the festival moves from the warm embrace of the J. Christopher Wines barrel room to two new locales. On Saturday, it’s Sokol Blosser, and on Sunday, Elk Cove Vineyards. The program is a nice mix – some newer music, music by a female composer, and a big, old favorite by a dead white guy. Sasha Callahan and Leo Eguchi. Small-scale music by Philip Glass (who, like festival resident composer Joan Tower, is celebrating his 80th birthday year) opens the concert. 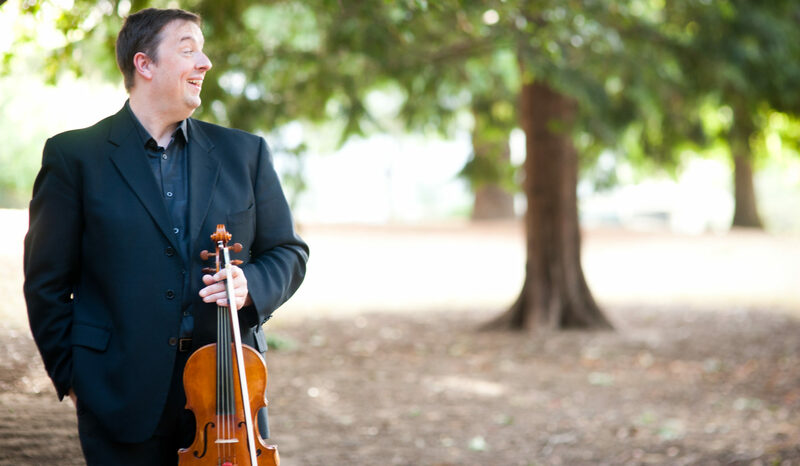 His Four Duets for Violin and Cello (extracted from his Double Concerto for Violin and Cello), written in 2010, will be performed by festival co-directors Sasha Callahan and Leo Eguchi. Poem for string quartet by the British-American composer and violist Rebecca Clarke (active in the first quarter of the 20th century) follows. Most famous for her wonderful Viola Sonata, her compositional career was limited by her gender, and she eventually stopped composition entirely after marrying. What might have been, one wonders, if she had lived in a time where being female and being a composer weren’t mutually exclusive? Callahan and Eguchi are joined by Megumi Stohs Lewis and myself. Marilyn De Oliveira – Photo: Jacobe Wade. Finally, the great String Quintet in C-major by Schubert closes the program. Oregon Symphony Assistant principal cellist (and member of the Mousai REMIX and Pyxis Quartet) Marilyn De Oliveira joins the quartet for this sublime ending to the festival’s third season. Is Schubert’s Quintet perhaps the greatest and most perfect piece ever written for chamber ensemble? Many think so. Come decide for yourself! I can’t believe that it’s been nearly two months since my last post! Lots of stuff has been happening, musically. In early July I was at the Oregon Bach Festival in Eugene, Oregon. I played three orchestral concerts there, and two chamber music concerts. The orchestral concerts were a mixed bag of repertoire. The first concert consisted of the world premiere of The Passion of Yeshua by Richard Danielpour, conducted by JoAnn Falletta. The final orchestral concert was the Elijah oratorio by Felix Mendelssohn, conducted by John Nelson. In between was a hybrid orchestral-chamber music concert. It featured the music of JS Bach and Philip Glass. Our piano soloist in the Oregon premiere of Glass’ Third Piano Concerto and Bach’s G minor piano concerto was the incredible Simone Dinnerstein. We performed without a conductor per se, but with Simone leading as needed from the piano. The opening piece was Bach’s Brandenburg Concerto No. 3, also without a conductor, led by OBF orchestra (and OSO) concertmaster Sarah Kwak. Then, in our festival debut, was the Pyxis Quartet (part of the new 45th Parallel Universe collective) playing Glass’ String Quartet No. 5. Glass was in attendance at the concert, and was also generous enough to give us a bit of time to play through some parts of the quartet the afternoon before the concert. It was a fantastic experience – very much a once-in-a-lifetime sort of musical happening! Post quartet selfie with Philip Glass: L-R: Marilyn De Oliveira, Charles Noble, Philip Glass, Ron Blessinger, and Ruby Chen. Then, after a week off at home, I was off to Coos Bay, Oregon for the Oregon Coast Music Festival. This festival has been going strong for 40 years, and this was my first time taking part. James Paul is the music director, and the orchestra comes from all over the western U.S. It was a blast from the past for me, as many in the orchestra played in the Cascade Festival orchestra which I took part in in Bend, Oregon for several years back in the late 1990’s. It’s a large orchestra, and the repertoire was sized to match – Rimsky-Korsakoff’s Scheherazade, Brahms’ 4th Symphony, and Strauss’ Don Juan were the major works of the week’s classical concerts. It was a super fun and relaxed festival, and it was also much cooler than the nearly triple-digit temps that folks inland were dealing with during the week! Now I’m home again, and getting ready for some chamber music concerts in the Oregon Wine Country. I’ll give you the low down on those later this week.